Houston, We have you covered. What is an AC Float Switch and why does my home need one? Imagine this scenario: After a long and exhausting day at work you set out on your way home. In Houston there's always a 100% chance of traffic, so you spend some time bumper to bumper with the people in front of you when you realize you need to swing by the grocery store to grab a few odds and ends. You get off the freeway, run into the grocery store, pick up a few things, wait in line and check out. You rush to your vehicle, load your groceries into your car buckle up and start to finally head towards home and.. Sit in more traffic. You finally arrive at your house and pull into your driveway, park your vehicle, start unloading the groceries and heading towards the front door. You open the door, take a step inside and immediately you notice the 'squishing' sound coming from you footsteps and quickly discover the carpet is soaking wet all the way to the front door! You drop the groceries and start searching around your home for the source of this catastrophe. Following the dripping sound coming from your living room you approach the room's entrance to investigate and there it is - You glace up only to find your ceiling has collapsed all over your living area, there is wet sheet rock all over the place and a steady flow of water pouring out of the center of the disaster that was once your living room ceiling, still soaking into your squishy carpet! What the @*$^? What is going on? Do I have a roof leak? It didn't even rain today.. Why is it raining inside my house? Is this some sort of a poltergiest? Then suddenly you realize - Directly above the ceiling where the water is coming from is exactly where your air conditioning system is located in the attic. You grab a flashlight, head into the attic, crawl over towards the air conditioning system, and sure enough water is over-flowing everywhere and dripping directly on to the sheet rock ceiling below it. It can happen! But what exactly happened here? News flash: Air conditioners have drain lines! Many people don't realize that air conditioners also help dehumidify their home's air and this process involves removing water moisture out of the air. When the air conditioning system runs, it not only cools the temperature of the air in your home, but it also removes humidity out of the air within your home and collects this moisture in a large drain pan hidden away inside your AC system below the system's evaporator coil. Since Houston has such a humid climate, air conditioning systems remove 20-30 gallons of water a day from the air within your home and all this water has to drain somewhere, so your AC system collects this water and attempts to drain it into your homes plumbing (typically a bathroom sink). If this AC drain ever becomes clogged (or if the sink your AC system drains into ever becomes clogged), the AC system still continues to run, cool, dehumidify and pull moisture out of the air and attempt to drain it into your home's plumbing. But with a clogged drain, all this water the air conditioning system has collected cannot properly drain out of the system's drain pan and as the system continues to run the pan quickly fills with water and over flows onto the area directly below the system. Now, HVAC engineers in Houston have realized over the years that Houston is a hot a humid climate so air conditioning systems are going to run a lot throughout the day, which means they are going to pull a lot of water out of the air every single day and attempt to drain all this water every single day. So since AC drains can (and do) clog, it is now code to have an extra secondary drain pan located underneath every AC system just in case the first (primary) drain pan ever clogs and begins to over-flow. This 'secondary' drain pan serves as a back-up drain pan and it's never supposed to be full of water but it's there just in case the AC system's first drain ever does clog, back up and over-flow. So if you're ever in your home's attic and notice that the secondary drain pan is full of water you immediately know that the first (primary) drain line is clogged and overflowing into the secondary drainage system and it needs to be addressed. Awesome! So, I just checked and my AC system has 2 drain pans too! I guess I can stop reading this article now... Hey wait a minute.. What if my secondary drain pan ever clogs? What happens then? It can happen! 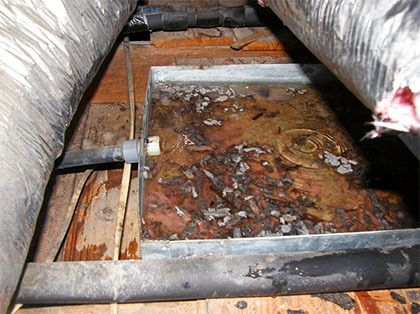 Both primary and secondary AC drain pans clog all the time, just ask some of the people you know or work with if they have ever had this unforunate experience at their own house. Drain pans, like swimming pools, require periodic maintenance and this is just one of the reasons why periodic HVAC maintenance so important and it's why clearing and treating drain lines is just of the many things we perform at Adams Air when we provide our HVAC preventative maintenance services but it's also something you can and should do yourself just to protect your home. Since HVAC drain lines are like swimming pools - If you leave a swimming pool's water untreated, you'll notice slime and sludge and life begins to form on top of and within the water. 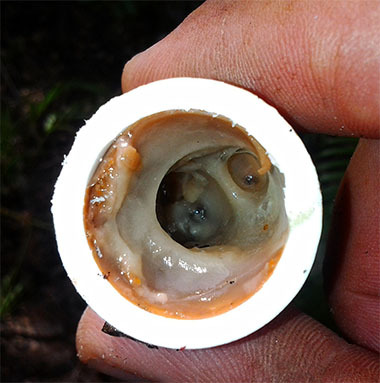 Well, this happens inside your AC system's drain pans too! But unlike a swimming pool, AC drain pans have a small drain line they have to drain all their water through, which contains plumbing traps, turns and sharp bends that the water must easily pass through. This means they are particularly easy to clog once slime and sludge and everything beings to form. So as you can imagine, over a short period-of-time both a primary and secondary AC drain line can quickly can become clogged and begin to over-flow onto your ceiling, causing a lot of damage along with it (which is why you want to keep these pans and their drain lines cleared and treated). Once the AC drain line gets clogged, it's probably going to happen again and again. This is because it's so hard to clear out the entire drain line once the slime and sludge begins to form, dry, and harden and form again. When this happens, over the course of time between heating and cooling seasons when the AC system isn't running or draining any water, the moist slime and sludge will harden into a calcium like substance. Then, once cooling season rolls around again and the AC system kicks on, the drain will quickly form another layer of slime on top of this hard calcium-like layer from the year before, and clog. If your drain line ever does clog, it's best to cut the drain line in half and examine the inside of the drain pipe itself. If it looks like water is going to have trouble flowing through the pipe, it's best to change out the entire drain line, because at this point you can bet it the drain line clogging again, and nobody wants that! I see.. Well I really don't have the time to check how my AC system is draining all day, every day. It's hot up there and I may be busy or forget to check these things. Not to mention, what if I go out on vacation, or to work, or have an emergency and my drain clogs? What happens then? What can I do to keep this from ever happening? 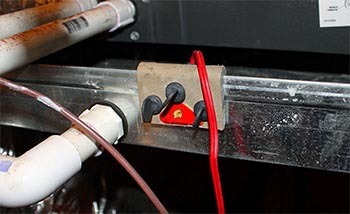 A float switch is essentaially an electronic water sensor for your HVAC system. What it does it gives your AC system the ability to detect if it has a clogged drain, and if the switch detects a clogged drain scenario, it immediately shuts the system off. It shuts my AC system off? For what? What's the purpose of that? Ah, good question. When the AC system is shut off, it no longer dehumidifies or pulls moisture out of the air, which means it isn't going to keep dumping water into a clogged drain line which would cause it to over-flow. There are many types of float switches, some come with audible alarms, some come with visual alarms, but most just turn the AC system off (which is usually enough of an alarm for most Houstonians). This is going to of course make your home's indoor temperature rise, in which case you'll know that the AC system needs to be examined because it's not running. And, if you remember that you have a float switch, you can easily go into the attic and examine the AC systems drains. If they are clogged, you then can try unclogging them yourself, or place a phone call to an AC professional to come unclog your system's drains. Float switches are great, and can save anyone the headache and expense of coming home to a collapsed ceiling or water damage to their home and it's furnishings. These switches come in many styles, some clip to the drain pan, some are actually installed in-line with the system's drain line, it just depends on the application to determine which type of switch is best, I've even seen some people install both of these types of switches on a single system. 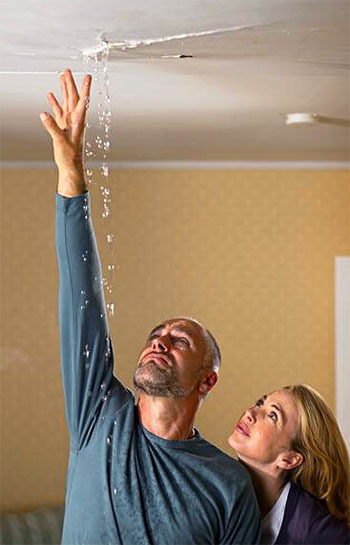 They're pretty simple to install if you feel like giving it a go and if your familiar with installing a light switch then installing a float switch is very similar. Float switches can be purchased online or from various hardware stores or AC supply houses and shouldn't take you more than an hour to install. As always when dealing with electricity - Turn off the power and follow the manufacturers instructions! And if you ever need a professional to come install one correctly, we are always more than happy to assist at Adams Air. Thanks for reading! I hope you've learned a little about your how an HVAC system drains and also what you can do to help protect your home. 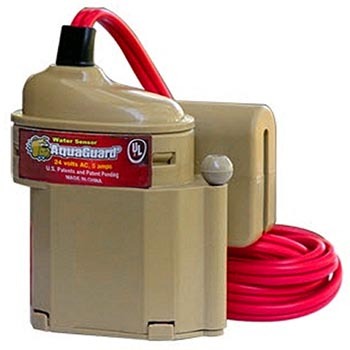 Many people move into new homes and don't even realize the previous owner installed one of these, so you may want to go check and see if you have one installed on your HVAC system and if not, at least clear and treat your drain lines just in case the previous owner never paid much attention to their AC drains. Thanks again, and as always, stay cool my friends! We aim to Simplify life by supplying the client-focused comfort and service you deserve, and nothing less.